Yesterday, we released new analysis showing where people believe that undocumented immigrants commit more crimes, based on a question Pew asked in August of 2016. When it comes to undocumented immigrants currently in the U.S which comes closer to your view — even if neither is exactly right. To begin, we find that these attitudes benefit from geography. We estimate that 27 percent of people believe immigrants are more violent nationally, but 29 percent of people believe that in the median state. This aligns with our previous research suggesting that anti-immigrant views benefit from political geography. One thing that stands out looking at the map is that the states with the most anti-immigrant views are also the states where immigrants don’t tend to concentrate. To explore this, we use a variable from the Census Bureau that includes the share of each state that is accounted for by new immigrants arriving between 2010 and 2016. The average share of new immigrants in states was 1.5. The state with the highest share of new immigrants was New York (where 23 percent of people think immigrants commit more crimes followed by DC (where 12 percent do), and the state with the lowest was West Virginia (where 39 percent of people think immigrants commit more crimes). As the chart below shows, this relationship is strong across the data. The adjusted R-squared of the model is .62, indicating that the share of a state’s population that is new immigrants explains a good portion of the variation in anti-immigrant views. The coefficient indicates that a 1 point increase in the percent of new immigrants in a state is associated with a four point decrease in anti-immigrant attitudes. 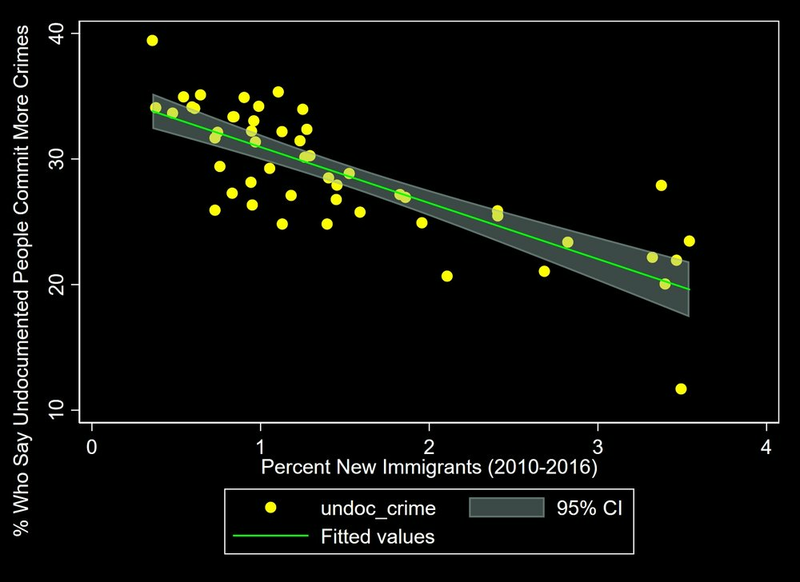 The states with the lowest share of new immigrants are the states where people are most likely to believe that undocumented immigrants are more prone to crime.